Introduction: Nonsteroidal anti-inflammatory drugs (NSAIDs) are widely prescribed and used medications that are used as analgesic, antipyretic, or anti-inflammatory agents, but have a high risk of adverse effects. Objective: The main purpose of this study is to evaluate the knowledge of patients toward the risks and safe usage of NSAIDs. Methods: A descriptive cross-sectional study was conducted among patients who attended orthopedic clinics at King Khalid University Hospital in Riyadh, Saudi Arabia, during December 2017 to February 2018. A self-administered questionnaire comprising three sections [sociodemographic information, patients' knowledge of NSAIDs, and the attitude toward receiving information about NSAIDs' adverse drug reactions (ADRs)] was used. The attitude was measured with a 5-point Likert scale. Results: The mean duration of NSAIDs usage was 7.3 ± 6.9 years. Only 45% of the respondents used NSAIDs daily, while 38% said they only used NSAIDs as needed. Nearly one-quarter of patients (25.5%) were counseled by a healthcare provider on the risks of NSAIDs. Almost 94% and 90.5% of the study subjects agreed that physicians and pharmacists, respectively, should play an essential role in providing information regarding ADRs to their patients. More than half of the respondents claimed that information about ADRs might lead them to discontinue their medicines. More than one-third of respondents stated that their healthcare setting provided them with insufficient knowledge of ADRs. Conclusion: Counseling of patients may diminish potentially inappropriate use and increase risk awareness. Healthcare providers can improve their role in identifying and counseling patients on NSAIDs. A National Health Interview Survey was carried out in 2010 among residents of the United States, and the results showed that around 29 million adults were regular users of NSAIDs. Studies also showed that the high incidence of the use of NSAIDs is associated with risk of renal failure, gastrointestinal problems such as ulcers, liver diseases, hemorrhagic stroke, and allergic reactions.,,,,,,,, When NSAID users were questioned about the side effects, only a few study subjects were aware of side effects such as upper and lower gastrointestinal bleeding, hypertension, gastritis, myopathy, and osteoporosis. The high incidence of adverse effects, lack of safety usage, and limited knowledge ofthe adverse effects of NSAIDs and their drug interactions have been reported among patients or pharmacy clients.,, In addition, the easy access of most NSAIDs as OTC medications makes its consumers more vulnerable to the associated adverse effects., In Saudi Arabia, both nonprescribed and prescribed NSAIDs can be bought from the pharmacy without a prescription or healthcare instructions in most cases. This issue raises the concern of whether patients in Saudi Arabia have any basic knowledge about the safe usage and side effects of NSAIDs. The objective of this study is to evaluate the knowledge of patients toward the risks and safe usage of NSAIDs. A descriptive cross-sectional study was conducted among patients who attended orthopedic clinics at King Khalid University Hospital in Riyadh, Saudi Arabia, during December 2017 to February 2018. All patients who attended the orthopedic clinics during the study period were invited to participate in the study by completing a questionnaire. Patients who were older than 18 years and were prescribed NSAIDs for at least 1 month were included in the study. Patients were excluded if they were unable to complete the questionnaire. A self-administered questionnaire comprising three sections was used. The first part involved sociodemographic information such as age, gender, education levels, income, and job status. 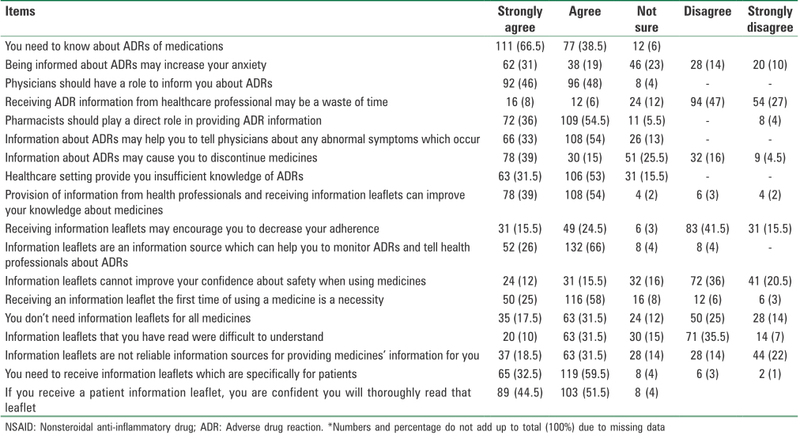 The second part included seven questions assessing patients' knowledge of NSAIDs, while the third part consisted of 18 questions with a 5-point Likert scale (strongly agree, agree, not sure, disagree, and strongly disagree) to measure the attitude toward receiving information about NSAIDs' adverse drug reactions (ADRs). This questionnaire was adapted and modified based on previous studies. Since the items of original questionnaire were available in English, an expert professional translator was used to translate the document to Arabic. The translated questionnaire was also used for face validity among 10 patients to ensure the appropriateness of language. Furthermore, five experts in the field performed content validity and determined Cronbach's alpha coefficient to be 0.78. Statistical Package for Social Science version 25.0 (SPSS Inc., Chicago, IL, USA) was used for data analysis. Descriptive statistics including frequency and percentages were calculated for each question. A total of 200 participants were interviewed: about half of respondents were females (54%), while 46% of the study subjects were males. Furthermore, 34% of the respondents were between 34 and 51 years of age, and 48.5% of the subjects had a university education. 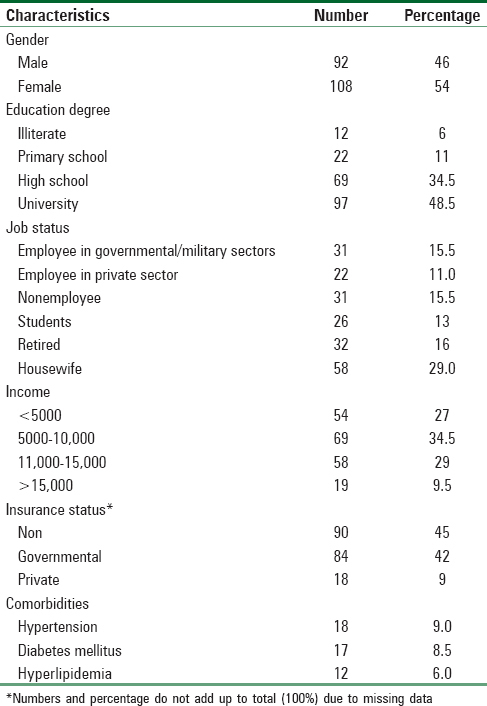 [Table 1] describes the detailed demographic data of respondents. In this study, the mean duration of NSAIDs usage was 7.3 ± 6.9 years. Only 45% of the respondents used NSAIDs daily, while 38% said they only used NSAIDs as needed. Of all the participants questioned, 36.5% and 34.5% of patients took NSAIDs once daily or twice daily, respectively. Only 21% of patients were taking NSAIDS before meal. 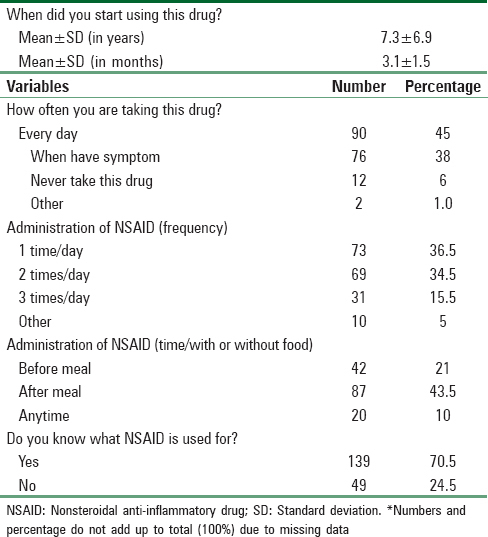 The pattern of NSAIDs administration as reported by respondents is shown in [Table 2]. [Table 3] shows counseling by healthcare provider on NSAIDs' utilization. Most of the patients did not receive counseling from healthcare providers regarding the safety of NSAIDs in terms of possible ADRs and its monitoring, management of side effects, avoidance of drug and food interactions, and so on. In this study, nearly one-quarter of patients (25.5%) were counseled by a healthcare provider on the risks of NSAIDs [Table 4]. In this study, nearly all patients agreed that they needed information regarding ADRs of NSAIDs. Almost 94% and 90.5% of the study subjects agreed that physicians and pharmacists, respectively, should play an essential role in providing information regarding ADRs to their patients. More than half of the respondents claimed that information about ADRs might lead them to discontinue their medicines. More than one-third of respondents stated that their healthcare setting provided them with insufficient knowledge of ADRs. Nearly all respondents were in agreement on “Provision of information from health professionals and receiving information from leaflets can improve their knowledge about medicines.” Only 40% of respondents reported that receiving information from leaflets might result in a decrease in their adherence. In addition, 41% of respondents reported that they had difficulty in understanding the information mentioned in leaflets. Nearly all respondents suggested that they needed to receive information from leaflets that was very specific for each patient [Table 5]. [Table 6] shows additional sources of information about NSAIDs use. Most of the respondents had received information about NSAIDs use from Internet (47%), followed by advertising or instructional pamphlet (41%) and television or radio advertises (12%). NSAIDs are widely prescribed and used as analgesics for persistent pain due to osteoarthritis and other musculoskeletal disorders in older adults.,, It was estimated that about 40% of individuals who were 65 years or older filled one or more prescriptions for a NSAID each year, while about 45% of respondents used NSAIDs daily., These results are consistent with our findings that 45% of participants used NSAIDs daily. Similar results have been reported among different ethnic groups in different societies. A study carried out in Nigeria showed that 42.6% of people had been using NSAIDs for more than a month. Another study conducted among Thai population revealed that most of their respondents (69.6%) used NSAIDs continuously or often. In addition, 45% of respondents were taking their NSAIDs before meals. In our study, only 21% of participants used NSAIDs before meals. Appropriate counseling of NSAIDs' administration and the coadministration of cytoprotective agents is necessary to decline the incidence of adverse effects, particularly the incidence of gastrointestinal risks. It is known that patient counseling and education help in promoting the appropriate use of medicines, which may lead to successful therapeutic outcomes and medication adherence. In our study, a majority of patients received counseling about the name of medicine, its indication, and mechanism of action. 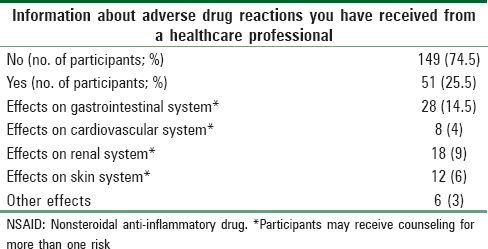 Although most of our participants have been using NSAIDs for a long time, only few respondents received physician or pharmacists counseling on risks of NSAIDs. Healthcare providers including pharmacists and physicians indicated that they rarely to sometimes counseled on risk of NSAIDs because they did not want to intimidate their patients who would likely benefit from therapy. However, lack of counseling on ADR monitoring of NSAIDs and management of side effect may leave patients with a misunderstanding of the risks of their NSAIDs' therapy. Although patients' counseling by healthcare professionals, particularly physicians, can play an essential role in promoting NSAIDs' risk awareness, a study carried out in the United States reported that a minority of patients on NSAIDs have received counseling on heart attack risk from both physicians and pharmacists., Furthermore, Oluwafisayo et al. stated that physicians do not provide enough information on ADRs without any satisfying justifications. Yilmaz et al. found that only half of the patients with osteoarthritis received counseling on the side effects of NSAIDs by their healthcare providers, particularly physicians, and pharmacists. Further research is required to offer guidance on how healthcare professionals can balance between stimulating patients' rights for gaining information to make informed decisions and, at the same time, diminishing unnecessary patients' concerns that may delay or prevent treatment. While only few participants received information about NSAIDs from healthcare providers, others used the Internet (66%), advertising or instructional pamphlet (41%), and television or radio (12%) to gain information about NSAIDs' usage. Internet (18.6%) and package inserts (5.4%) were also the most common resources for drug information among public in a study conducted in Saudi Arabia to assess public awareness about ADRs. In another study conducted in Malaysia, 15% of respondents were reported to obtain drug information from Internet and 9.2% from media. Oluwafisayo et al. reported that most of the respondents obtained information from reading drug literature inserted in the packs, followed by television (15.2%) and radio (7.4%). Regardless of additional resources for drug information that may deliver inaccurate information, our study assessed the attitude of orthopedic patients toward receiving information about the safe use of NSAIDs, and almost 94% and 90.5% of the study subjects agreed that physicians and pharmacists, respectively, should play an essential role in providing ADR information to their patients. Knowing the risks of adverse effects plays a key role in a patient's decision to take the drug or not. The adverse effects informed by both physicians and pharmacists would be more accurate and specific to a prescribed medication for particular indications for each patient. Their counseling would cover symptoms that the patient should recognize for which the patient can either discontinue a drug to prevent additional harm or manage and monitor resulting symptoms or signs. A result showed that 41% of patients reported that information in leaflets were difficult to understand, and 56.5% of patients reported that information in leaflets cannot improve their confidence about the safety of the medication. A study was conducted in Saudi Arabia to assess the availability of key information on 60 medication package inserts provided with prescribed and OTC medications. It also measured whether information on package inserts is offered in a way that helps improve patient understanding. The findings revealed that package inserts were unclear regarding dosage information. Furthermore, they reported that the package inserts lacked information on measures to be taken when an administrative error was made, inappropriate performance of side effects, and measures to be taken if an ADR occurred. A similar study conducted in Palestine showed that only 42.3% of the customers found the information in the leaflets to be useful and sufficient. In addition, participants from a study conducted in Germany found that package inserts were difficult to understand or did not include important information. Similar findings were reported from Italy that Italian patients often read the package inserts but they neither understood the instructions easily nor could obtain the desired information readily. To reduce difficulty with understanding among our study population in Saudi Arabia, package inserts should contain more Arabic, a language that is easily readable, and must also be organized into an easy-to-understand forma. The majority of patients do not receive any information about the appropriate use or risks of NSAIDs. Counseling of patients may diminish potentially inappropriate use and increase risk awareness. Healthcare providers can improve their role in identifying and counseling patients on NSAIDs. The authors would like to thank the Deanship of Scientific Research, Research Center, College of Pharmacy, King Saud University, Riyadh, and primary health care of Imam Abdulrahman Al-faisal Hospital in Dammam Saudi Arabia for assisting this study. This work was supported by the College of Prince Sultan bin Abdulaziz for E.M.S. Research Center, Deanship of Scientific Research, King Saud University, Riyadh, Saudi Arabia. Green M, Norman KE. Knowledge and use of, and attitudes toward, non-steroidal anti-inflammatory drugs (NSAIDs) in practice: A survey of ontario physiotherapists. Physiother Can 2016;68:230-41. Gotzsche PC. Methodology and overt hidden bias in reports of 196 double-blind trials of non-steroidal anti-inflammatory drugs in rheumatoid arthritis. Control Clin Trials 1989;10:31-56. Van Tulder MW, Scholten R, Koes BW, Deyo RA. Non-steroidal anti-inflammatory drugs for low-back pain. Cochrane Database Syst Rev 2006;(1):CD000396. Davis JS, Lee HY, Kim J, Advani SM, Peng HL, Banfield E, et al. Use of non-steroidal anti-inflammatory drugs in US adults: Changes over time and by demographic. Open Heart 2017;4:e000550. Jani UA, Ford ES, Greenland KJ, Giles WH, Mokdad AH. Aspirin use among U.S. adults: Behavioral Risk Factor Surveillance System. Am J Prev Med 2006;30:74-7. Link KP, Overman RS, Sullivan WR, Huebner CF, Scheel LD. Studies on the hemoirhagic sweet clover disease XI. Hypoprothrombinemia in the rat induced by salicylic acid. J Biol Chem 1943;147:463-74. Gibson PC. Aspirin in the treatment of vascular diseases. Lancet 1949;2:1172-4. Craven LL. Acetylsalicylic acid, possible preventive of coronary thrombosis. Ann West Med Surg 1950;4:95. Yu A, Devine CA, Kasdin RG, Orizondo M, Perdomo W, Davis AM, et al. Pain management among Dominican patients with advanced osteoarthritis: A qualitative study. BMC Musculoskeletal Disord 2016;17:211. Shankar PR, Pai R, Dubey AK, Upadhyay DK. Prescribing patterns in the orthopaedics outpatient department in a teaching hospital in Pokhara, western Nepal. Kathmandu Univ Med J (KUMJ) 2007;5:16-21. Lee SH, Han CD, Yang IH, Ha CW. Prescription pattern of NSAIDs and the prevalence of NSAID-induced gastrointestinal risk factors of orthopaedic patients in clinical practice in Korea. J Korean Med Sci 2011;26:561-7. Zhou Y, Boudreau DM, Freedman AN. Trends in the use of aspirin and nonsteroidal anti-inflammatory drugs in the general U.S. population. Pharmacoepidemiol Drug Saf 2014;23:43-50. Phueanpinit P, Pongwecharak J, Krska J, Jarernsiripornkul N. Knowledge and perceptions of the risks of non-steroidal anti-inflammatory drugs among orthopaedic patients in Thailand. Int J Clin Pharm 2016;38:1269-76. Roderick PJ, Wilkes HC, Meade TW. The gastrointestinal toxicity of aspirin: An overview of randomised controlled trials. Br J Clin Pharmacol 1993; 35:219-26. Ofman JJ, MacLean CH, Straus WL, Morton SC, Berger ML, Roth EA, et al. A metaanalysis of severe upper gastrointestinal complications of nonsteroidal anti-inflammatory drugs. J Rheumatol 2002;29:804-12. Griffin MR, Yared A, Ray WA. Nonsteroidal antiinflammatory drugs and acute renal failure in elderly persons. Am J Epidemiol 2000;151:488-96. Hayden M, Pignone M, Phillips C, Mulrow C. Aspirin for the primary prevention of cardiovascular events: A summary of the evidence for the U.S. preventive services task force. Ann Intern Med 2002;136:161-72. Roshi D, Toçi E, Burazeri G, Schröder-Bäck P, Malaj L, Brand H. Users' Knowledge about adverse effects of non-steroidal anti-inflammatory drugs in Tirana, Albania. Mater Sociomed 2017;29:138-142. Yilmaz H, Gürel S, Ozdemir O. Turkish patients with osteoarthritis: Their awareness of the side effects of NSAIDs. Turk J Gastroenterol 2005;16:89-92. Jarernsiripornkul N, Phueanpinit P, Pongwecharak J, Krska J. Experiences of and attitudes towards receiving information about non-steroidal anti-inflammatory drugs: A cross-sectional survey of patients in Thailand. Expert Opin Drug Saf 2016;15:417-26. Marcum ZA, Hanlon JT. Recognizing the risks of chronic nonsteroidal anti-inflammatory drug use in older adults. Ann Longterm Care 2010;18:24-27. Hochberg MC, Dougados M. Pharmacological therapy of osteoarthritis. Best Pract Res Clin Rheumatol 2001;15:583-93. Ray WA, Stein CM, Byrd V, Shorr R, Pichert JW, Gideon P, et al. Educational program for physicians to reduce use of non-steroidal anti-inflammatory drugs among community-dwelling elderly persons: A randomized controlled trial. Med Care 2001;39:425-35. Oluwafisayo AJ, Mlenzana NB, Shamila M, Nesto T, Grace M. Side effects of non-steroidal anti-inflammatory drugs: The experience of patients with musculoskeletal disorders. Am J Public Health Res 2014;2:106-12. Awodele O, Fadipe AO, Adekoya M, Adeyemi OO. Prescribing pattern of non-steroidal anti-inflammatory drugs at the Outpatient Pharmacy Department of Lagos University Teaching Hospital, Nigeria. Ghana Med J 2015;49:25-9. Albekairy AM. Pharmacists' perceived barriers to patient counseling. J App Pharm Sci 2014;4:70-3. Schmitt MR, Miller MJ, Harrison DL, Farmer KC, Allison JJ, Cobaugh DJ, et al. Communicating non-steroidal anti-inflammatory drug risks: Verbal counseling, written medicine information, and patients' risk awareness. Patient Educ Couns 2011;83:391-7. Wynne HA, Long A. Patient awareness of the adverse effects of non-steroidal anti-inflammatory drugs (NSAIDs). Br J Clin Pharmacol 1996;42:253-6. Sales I, Aljadhey H, Albogami Y, Mahmoud MA. Public awareness and perception toward Adverse Drug Reactions reporting in Riyadh, Saudi Arabia. Saudi Pharm J 2017;25:868-72. Sulaiman W, Seung OP, Ismail R. Patient's knowledge and perception towards the use of non-steroidal anti-inflammatory drugs in rheumatology clinic Northern Malaysia. Oman Med J 2012;27:505. Carrigan N, Raynor DK, Knapp P. Adequacy of patient information on adverse effects. Drug Saf 2008;31:305-12. Tarn DM, Wenger A, Good JS, Hoffing M, Scherger JE, Wenger NS. Do physicians communicate the adverse effects of medications that older patients want to hear? Drugs Ther Perspect 2015;31:68-76. Al-aqeel SA. Evaluation of medication package inserts in Saudi Arabia. Drug, Drug Healthc Patient Saf 2012;4:33-8. Rowa'Al-Ramahi AN, Na'emKettana WS. Attitudes of consumers and healthcare professionals towards the patient package inserts – A study in Palestine. Pharm Pract 2012;10:57-63. Fuchs J, Hippius M, Schaefer M. Analysis of German package inserts. Int J Clin Pharmacol Ther 2006;44:8-13. Al Aqeel S, Abanmy N, Aldayel A, Al-Khalifa H, Al-Yahya M, Diab M. Readability of written medicine information materials in Arabic language: Expert and consumer evaluation. BMC Health Serv Res 2018;18:139.